As LetzRoll Offroad preps their tooling for SEMA, the group will be building a 2000 Jeep TJ that will be Rebel Tough! 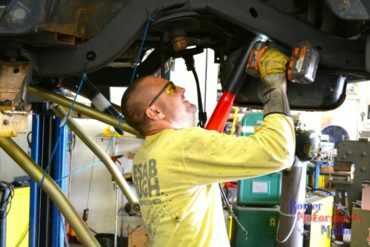 "We wanted a Jeep at ESAB, but we didn’t want just another run of the mill Jeep, we wanted to highlight our plasma cutters and welders to build something unique. Our shopping wasn’t done at a dealership on a showroom floor it was done on Craigslist! We found a 16 year old Jeep that had been sitting at an apartment building, under an awning, waiting for the next owner to give it the attention it deserved. When the guys at LetzRoll went to pick it up, it didn’t even start! Luckily, it should just be a battery issue, but that is something they will be diagnosing sooner than later. The plan is to build it into a Jeep that can cruise 65-70 mph down the highway and then rock crawl with the best of them." 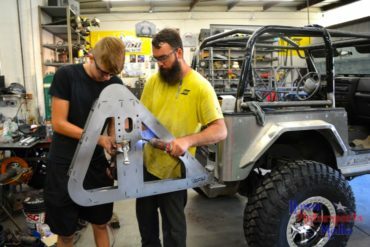 The hammers, plasma cutters and welders came out right away at LetzRoll Offroad to start tearing down the Rebel Tough Jeep and start to build it back up with a new suspension system from MetalCloak. The goal is to make sure that a suspension system will be level and flat at ride height. 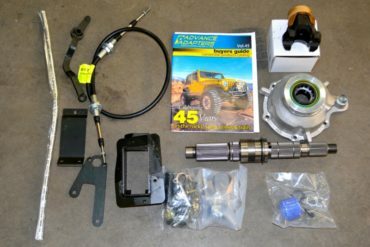 Because of the intended ground clearance for the build and the original geometry of the 2000 Jeep TJ, the decision was to install a 4.5” long-arm kit. 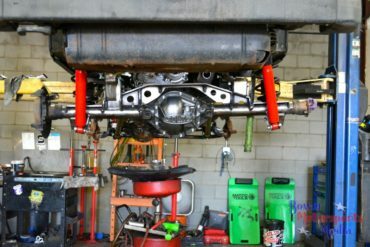 A long-arm kit moves all the brackets to the center of the vehicle and allows the angles of the control arms to act properly. A long-arm kit will allow the vehicle to be more stable by pushing the vehicle forward instead of trying to tip it over. The MetalCloak TJ Wrangler Lock-N-Load Long-Arm Suspension System RockSport Edition System features the RockSport Long Travel Shocks is not an entry level kit. Driven by technology, the suspension includes the patented Lock-N-Load™ Radius Arm, MetalCloak True Dual Rate™ Coils, Duroflex™ Control Arms with patent pending Duroflex Bushings, and the Durotrak™ equipped Track Bars -- no other off-the shelf Long-Arm kit can compare. To be able to install the suspension kit correctly the first step is prepping the frame, which includes using the plasma to cut off all the brackets for the stock axles and welding in the new ones. As the suspension mounts are utilized and the axles are being hung, the geometry is changing. It is important to take time to carefully measure the distances to make sure that everything lines up correctly from top to bottom and front to back. Yes, the horse comes before the cart, but sometimes the cart gets talked about first. That happened in this build. 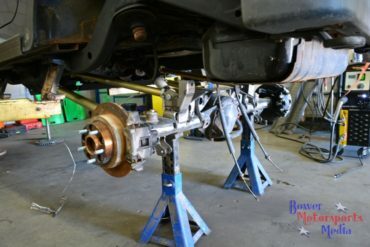 The axles for the Rebel Tough Jeep build got worked on before the suspension was hung, but then they weren’t finished until after the suspension was completed. Let’s talk axles. The Dana 33 axles that come in a TJ from the factory are inherently weak so it was an automatic assumption that the axles would be upgraded. LetzRoll Offroad sourced a pair of TJ Jeep Rubicon front and rear axles replacing weak with a much beefier option. But, that still isn’t good enough to be Rebel Tough. Time to call in Artec Industries Truss Kits for the front and rear. A truss kit not only makes the axle tube and housing stronger, but it also reinforces all the brackets. Anything hitting the rocks while we are out on the trail will now have to compete against the Artec strength! Installing the bracketing properly is very labor intensive and important to do it correctly. 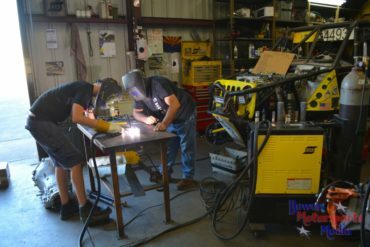 The plasma cutting tools start off the process removing all the factory pieces and the welder finishes it installing the reinforcement. This process has to be done in a planned sequence while paying attention to the amount of heat applied to each section of the housing to eliminate any possibility of warp damage. Now that the outside is beefed up, let’s turn to the inside. Because bigger and heavier tires and wheels will be added, the gear ratio of the vehicle needs to change to be able to get the Jeep down the trail! When talking gears, numerically higher actually means a lower gear ratio. Yukon Gear & Axle is LetzRoll Offroad’s gear and axle of choice. The new axles are now loaded with Yukon 5:13 Gears, U-Joint Circle Clips and Chromalloy 4340 Axle Shafts that are 50% stronger than stock. Setting gears is a talent and sometimes referred to as an art, the goal is to have a pattern where the gears line up perfectly in a forward and reverse direction. With adding tougher axles, a suspension lift, and the intent of bigger wheels and tires, it is time to look at the drivetrain of the Rebel Tough Jeep. Driveline angles need to be addressed to continue the focus on toughness and eliminating the possibility of vibrations. With the planned modifications, the short, stock driveshaft and slip-yoke design will not accommodate the steepened driveline angle. 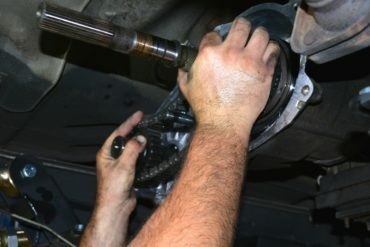 The Advance Adapters Slip-Yoke Eliminator Kit eliminates the splined output and slip-yoke rear drive-line replacing it with a heavy-duty mainshaft and a fixed-yoke flange. 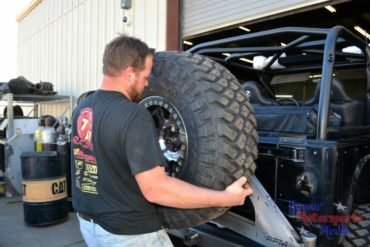 This allows the Jeep to feature a custom length CV Driveshaft that will fit correctly and be able to articulate with the vehicle moving down the trail. 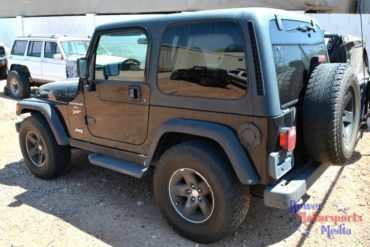 Shifting into 4-wheel drive should be easy and fun! To make sure the Rebel Tough Jeep can slip from 2-wheel drive into 4-high or 4-low quickly and easily the Advance Adapters Cable Shifter was installed. This heavy-duty shifter was designed to correct the binding, hard shifts, and slipping out of gear that is inherent when lifting a Jeep TJ or altering its drive train components. There is one more component to the drive-train before it becomes a full roller: Wheels & Tires! We keep talking about the bigger wheels and tires – well, here they are! Maxxis RAZR MT 37X12.50R17LT Mud Terrain Tire paired with the Raceline Monster Beadlock 17” Wheel. The combination makes an aggressive pair to take the Rebel Tough Jeep on any adventure it wants. The choice to add a beadlock wheel to the Jeep was easy. Not only does a beadlock wheel allow the tire to remain clamped to the wheel for added security, it also allows for extreme airing down possibilities so we can get the contact pattern of the tire down onto the ground regardless of the terrain challenge: rocks, dirt, mud or sand! Mounting the Maxxis Tires to the Raceline Beadlock Wheels is a process. 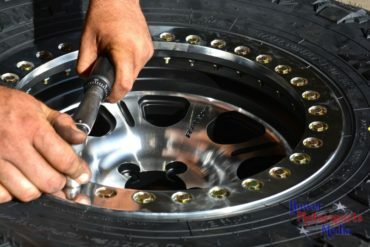 The tire easily mounts onto the wheel, with the ring going along the top. Then come the 32 bolts. Finger tight, then impact tight, and finally torqued to 18-22 inch pounds in a crisscross pattern. Maintenance when using a Beadlock wheel requires a regular check of the bolts torque. Safety is a top priority at ESAB. There was no question about installing a LetzRoll Offroad Custom Sport Cage in the Rebel Tough TJ Jeep. These cages are unique because they use a through the dash design to help spread the load of a potential impact throughout the entire jeep, adding additional safety to the factory cage and protection for the rear passengers. When choosing tubing, LetzRoll uses the strongest materials for a cage this size: 1.75” x .120” wall DOM. DOM, Drawn Over a Mandrel, is tube that is rolled at close to room temperature and made from SAE 1020 steel. It is one of the strongest types of tubing, next being seamless. To build the cage, the tube goes through a series of processes to become a masterpiece: Measure it, bend it, and notch it. 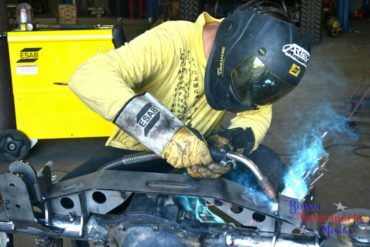 Once it’s ready to take shape the ESAB Mig welder comes out to start tacking, followed by final welding once final fitment is approved. Finishing is always important with a nice wire brush and a black paint or powder coat. You can’t go offroading without protection. The right protection. When it came time to bolt on the toughest body components for the Rebel Tough TJ Jeep, LetzRoll turned to Artec Industries and RPM Fab, both made and welded in the USA. The Artec Industries TJ line of armor is being featured for the first time at the SEMA show on this vehicle! The aluminum front fenders, rear corner protection with rear fenders and the steel rockers slid on and make the Jeep look classy. 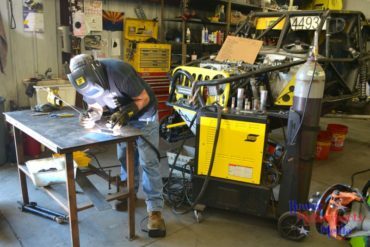 The RPM Fab TJ bumpers are made from 3/16” steel that is CNC cut on a plasma table and welded near LetzRoll Offroad in the greater Phoenix, Arizona area. The front bumper will hold the winch and has weld through D ring mounts, much stronger than surface mounted. The rear tire carrier incorporates the entire door so the weight of the 37” tire isn’t sitting just on the corner of the bumper, but the load is spread across the entire back of the vehicle. Installation is normally a bolt-on process, but the reality is, nothing is just a bolt-on process. Fabrication and tools of the trade become important to any project. Even taking off all the rusty old parts was a feat and a fun challenge! Doing a SEMA build is a grueling task. There are the major components and then there are 1000 other parts and tasks that need to be touched or completed before it can hit the ESAB Cutting and Welding 2017 SEMA Booth #21629. The Rebel Tough TJ Jeep built by LetzRoll Offroad is almost completed, in fact the next time you will see it is in Las Vegas! The ComeUp Winch with Synthetic Rope will lead the helm of this Jeep topped with two Feniex Lightbars. Underneath, the front end is now complete with a LetzRoll Offroad Steering Linkage system and PSC Steering hydro assist kit that will make the steering buttery smooth. Also underneath, the Artec 1” Body Lift will give it the clearance that the Jeep needs to traverse obstacles and the tires the articulation room to move. Replacing probably the most rusted piece on the original Jeep, a new GenRight Fuel Tank with a protective skid plate will increase the fuel range. Finally, the rear sway bar is also by GenRight Offroad. The inside of the cab got rhino lined black for an easy–to-clean finish. Plush Corbeau seats replaced the old cracked and torn seats and the back seat has a matching cover. A padded and locking Tuffy console replaced the tattered center console. This TJ won’t have a top or full doors for the show, but it will feature LetzRoll Offroad cage and tube doors with locking latches. 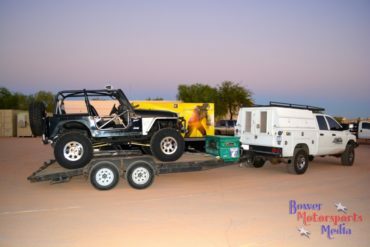 The Jeep has completed a few laps around the block and has officially gone into 4Low crawling up onto the trailer to head to get wrapped at Wrap Yours. In preparation for wrap, a lot of the parts that had previously been installed have now come off onto a blanket to wait for final assembly. Yes, you are right, the show starts in 4 days! The next time you see this 16 year old Jeep that had been sitting at an apartment building under an awning rusting away before ESAB saved it and LetzRoll put their hands on it, it will be a beautiful diamond on the showroom floor of the most prestigious show of the year: The 2017 SEMA Show. SEMA's reaction to the Rebel TOUGH Jeep was outstanding. The Jeep, which is the personal vehicle of Ken Konopa, who runs Marketing and Engineering at ESAB. The build used ESAB's new Rebel AC/DC product which also launched at SEMA. Many products used on the Rebel TOUGH build aren't available yet on the market. The fenders, doors, roll bars, and bumpers were all hand-welded (using the Rebel AC/DC) and made for the build. Ken Konopa loved the build, "I can't wait to get it on the trails and drive it. I didn't know what to expect. I left it in Andrew's hands and he turned it into something we can show at SEMA and LetzRoll would be proud of. " "Special thanks to our partners, this build wouldn't be possible without your support.